Looking for exceptional event favors that can be personalized to make truly memorable mementos of your special occasion? Well, Fashioncraft's exclusive Glassware for All Occasions collection is the clear choice. 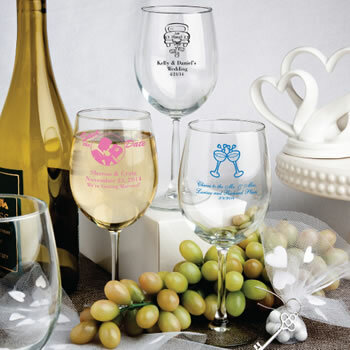 Offered in a cheerful array of personalized silkscreen designs including wedding, engagement, bridal and baby shower, christening, First Communion, confirmation, Sweet 16 and 15, birthday, retirement and more, our wine glass is pure class. The perfect accompaniment to any celebration, each 12 ounce Alto wine glass is 7.50" tall and 3" in diameter glass with the classic stemware shape and is made in the USA of quality domestic glass. Sold and packaged in bulk, Fashioncraft's Glassware for All Occasions wine glasses are sure to be the toast of the town as event favors with style! The glasses were priced perfectly for my budget, came in a timely manner and came looking PERFECT! Couldn’t be happier with the service. I highly recommend! I just wish the writing would have been bigger on the glass. I really like how this product came, like I expected! The way the glasses were packed was so good that none of it broke or got damaged👍! It arrived on time and the personalized design was beautifully crafted!! I have ordered items from nice price favors before. They are amazing! I ordered stemless and regular wine glasses. The glasses always come packed so well--and I have never had any breakage. They also arrive in record time--even around he holidays. The recipients always love them and ask where I got them. I am only too happy to tell them. I love nice price favors and will keep ordering from them in the future! I have been shopping with them for the past 6 years . And I just love my glasses and use them and my guess love it more than me . So they think . One outstanding thinks if you place the order on line and you made a mistake with prices or they think you misunderstand . They will call you to bring it to your attention before placing the order. If you are looking for glasses or any other favor . This is the place to start shopping . And stop looking at other web site. I MUST add I had dealings with customer service Holly she was great . No extraordinary . Very professional and very helpful and follow up with my order . Again I love there prices . You will not be disappointed. Well packaged, arrived on time, quality glass and print. Text was a bit small, but legible and fit on one side. Exactly as described. Loved them and great price. I Will order from them again. I have to admit I was a little nervous ordering online and not actually being able to hold the glass before buying. I was worried they would feel like a cheap glass. I was sooooo happy when they arrived. They are perfect and just what we wanted for favors for my daughters wedding. They arrived quickly and were packaged so well. I am more than happy with this purchase and would definitely recommend Nice Price Favors! Expected wine glasses to be taller like shown in picture but they definitely resemble more of a water goblet than a wine glass. i ordered these wine glasses with the champagne bottle image and the phrase "Girls Gone Wine!" as a favor for a bachelorette party/wine tour. They came perfect! Cant wait to see the bride's reaction! So pleased! Just what we needed and very nice. The glasses came and were exactly what I was expecting...beautiful! They were well packaged for shipping and arrived quickly. I would definitely recommend the product and this vendor. This is the second time I have purchased these wonderful wine goblets and they are awesome! I recommend them to anyone having a party as they are GREAT party favors.